Hello. I've installed teamviwer from AUR, run "sudo teamviewer --daemon start" and "sudo systemctl start teamviewerd.service"
but when I start teamviewer on the bottom is label : "Not ready. Please check your connection"
My Internet connection works fine. Running program in terminal doesnt show any errors. Then teamviewer start, with "Not ready. 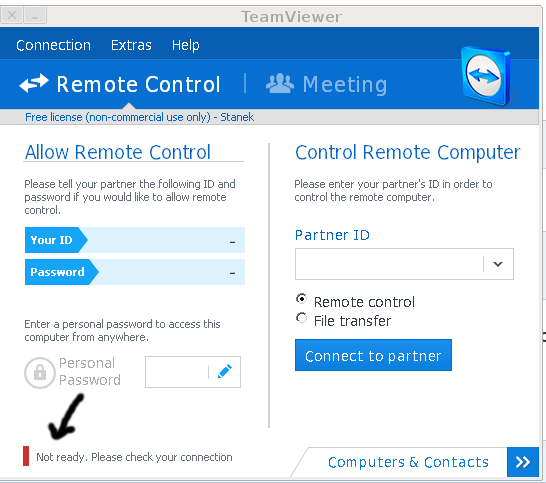 Please check your connection", then after a few seconds it switch to a green "Ready to connnect"
Your problem means that somehow, teamviewer cannot contact it's central server. And also try using teamviewer from another computer/os on same network. Pinging 178.77.120.1 works very well. Hi! Same problem here. Solution for me was add 'mdns4' to 'hosts:' list in /etc/nsswitch.conf. Can you elaborate on this? What did you actually add to the nss file? It seems pretty self-explanatory. Please don't necrobump.